When someone mentions the word yoga, what usually comes to mind is a picture of someone twisted up like a pretzel on a yoga mat. While yoga can be a challenging physical activity, it goes way beyond just poses. Yoga not only involves the body, but the mind and spirit as well. The word yoga comes from the ancient Indian language of Sanskrit and actually means “union.” It refers to the union of body, mind and spirit, so there is a lot more going on than just exercise. The poses or physical part of yoga is only one aspect, known as “asana” in Sanskrit, but that is only one part of the concept of yoga. What does that mean for your body, mind and spirit? Yoga is holistic, it involves the whole body. The entire meaning and function of yoga is meant to incorporate the whole being, the body, mind and spirit. As your body is engaged in the physical practice, you experience the other aspects as part of your routine. When trying to hold a pose you need to concentrate mentally in order to hold the position. You become centered in your own mind and inner world. While engaged in a pose, you may feel challenged and need to tap into your own mental and spiritual strength to move through it. As you continue to work with your physical practice, you will see an improvement in your health both physically and mentally. Your flexibility and breathing will become better. That will no doubt improve your mood and outlook as well. This creates a domino effect in your life. You may find that your relationships with others benefit too. Eventually your world becomes a better place! So if you think yoga is a great exercise—you’re right! Not only is it exercise for the body, it is exercise for the mind and spirit, the whole you! Our instructor Katie McNamara offers yoga and barre classes, and a class that is combination of both! Katie has been pursuing a healthy, active lifestyle in Seattle since 1992, when she moved here from Vermont. She has her 200 hour Power Yoga Teacher Certification from CorePower Yoga (December 2016), and her Barre Teacher Certification from Adrienne Kimberly’s Barre Bohemian (June 2016). 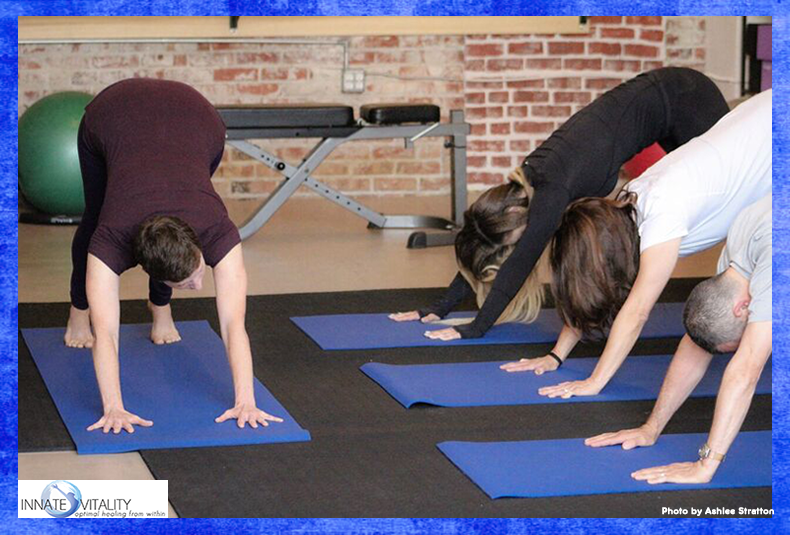 At Innate Vitality, all of our classes accommodate different levels of experience and fitness. So if you’ve done yoga before, or if you are new to the practice, come check it out and join the community! The classes are small so you get personalized attention and encouragement. Join the community! Sign up for classes today!